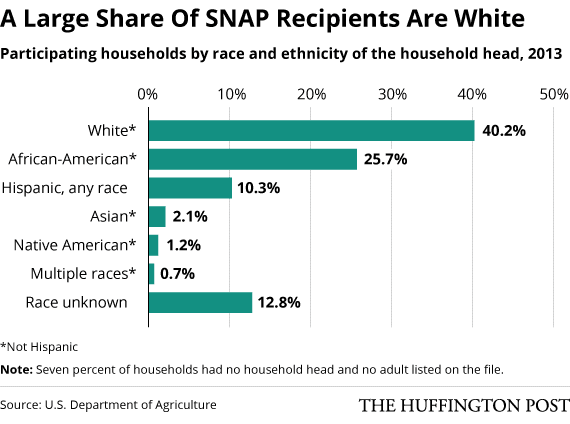 According to 2013 data from the U.S. Department of Agriculture, which administers the program, 40.2 percent of SNAP recipients are white, 25.7 percent are black, 10.3 percent are Hispanic, 2.1 percent are Asian and 1.2 percent are Native American. More discussion and data here. Being one of the 95.5% of the world's population that doesn't live in the middle of the northern part of the America's, I have to guess, frequently, about the meaning of acronyms posted on internet sites originating from that fine, non-metric country (it is only one of two non-metric countries now, you know). SNAP, I guess, is welfare stamps for the unemployed or disabled ? Almost 13% are unknown race - what's up with that? Are they, by any chance, legal citizens? Not sure your point about "real math" but for a program that is constantly belittled as catering to "minorities" it is ironic, if not downright offensive, that 40% of the participants are white. I think OP meant that relative participation should be considered, not [just] absolute (though I disagree with their choice of the term "real math"; both are real metrics). A lot of people would look at the original numbers and just say "Oh, that means whites are actually the laziest race to use anti-welfare peoples' description. Haha, that shows them!" But there are actually two separate questions (Is a minority individual more likely to receive SNAP? vs Which demographic receives SNAP the most?) that need addressing here. Reporting one but not the other is a case of cherry-picking data to push whichever agenda one sympathizes with. Interesting that Hispanics are so low. Local food pantries (private, not government run), gardening (we started a community garden for people who don't have a garden plot or land otherwise), raising animals (mostly chickens, but some goats), and supplements from a local church that gets the "leftover" bread and perishables from a big grocery store. Gene Alday, a Republican member of the Mississippi state legislature, apologized last week for telling a reporter that all the African-Americans in his hometown of Walls, Mississippi, are unemployed and on food stamps. "I come from a town where all the blacks are getting food stamps and what I call 'welfare crazy checks,'" Alday said to a reporter for The Clarion-Ledger, a Mississippi newspaper, earlier this month. "They don't work." Mississippi Congressional District 1 is 27% black, and the SNAP report linked to in the article says it has 275,000 households. That's about 74,250 black households. Only about 21,000 of them are receiving SNAP (50% of the 43,000 households receiving SNAP). So he definitely went too far. 28% receiving SNAP is far from "all", and he insulted the other 72%.